Dr Nelson Allen and his dental team are committed to providing personal, affordable and fun dental care for your kids. We operate under a simple rule: we treat your kids as we would treat our own. As a Board Certified Pediatric Dentist, Dr Allen is specially trained to provide a comfortable dental experience for you and your children. Digital Panorex: this dental machine is unique in that it takes a “panoramic” picture of the teeth. The machine makes an entire half-circle motion to capture an image of the child’s entire oral cavity. These X-rays are only necessary on initial visits and every few years thereafter. 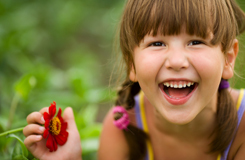 Oral Conscious Sedation: We can administer an oral sedative to relax your child before performing any dental procedure. Safe and effective, Oral Sedation allows your child to remain awake and aware, but their anxiety will be reduced for any dental procedure. IV Sedation: I.V. Sedation is recommended for especially apprehensive children and children with special needs that would not work well under conscious sedation. The dentist performs the dental treatment in our office with the child anesthetized under I.V. sedation, which is administered and monitored by our qualified team. Located right on Highway 5, our building is easily accessible. We have ample free parking in our building’s private lot. We offer convenient appointment times before work and school! Insurance is welcome and accepted at our practice. We are in network with most Dental PPO plans and we accept Medicaid. We accept all major credit cards, including Visa, MasterCard, American Express, Discover, and offer Patient Financing through CareCredit.